4/15 Cup of Coffee: Henry Owens (pictured) backed up a strong first outing with an even better one last night. Logan Boyd and Trey Ball also turned in solid outings, with some terrific relief appearances mixed in as well. Blake Swihart, Danny Mars, and Austin Rei played well offensively. 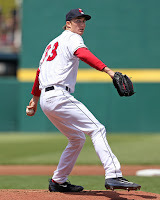 The PawSox won behind a strong start from Henry Owens, who struck out 10 in six innings while allowing just one unearned run. The tall left-hander has been using a new delivery and now has a 0.82 ERA in two starts. Chandler Shepherd also impressed on the mound, striking out five in two scoreless innings. Blake Swihart stroked a three-run double in the third inning, and Rusney Castillo and Ryan Court each went 2 for 4. The Sea Dogs dropped this one despite a solid effort from starter Trey Ball. He allowed just one earned run in six innings on five hits, two walks, and six strikeouts. Ty Buttrey struck out two and allowed a run in the final inning. Danny Mars provided most of the offense, collecting three of Portland's four hits with a 3-for-3 day that included a triple and a stolen base. He's batting .474 in the early going. Salem used a three-run second and a four-run seventh to collect the win. Austin Rei had a big night, going 2 for 4 with his sixth double of the season and first home run. Bryan Hudson and Jordan Betts also had two hits each. Roniel Raudes started and did not allow a run in three innings with three strikeouts and one walk. Austin Glorius also pitched well, striking out five in three scoreless innings. Logan Boyd was terrific during his outing, lasting 5 2/3 innings without allowing a run. He gave up five hits, two walks, and struck out seven. Hildemaro Requena threw 2 1/3 hitless innings before Dakota Smith finished it off. Santiago Espinal had three hits, including a double, and Bobby Dalbec went 1 for 3 with two walks. Player of the Night: Logan Boyd rebounded from a rough outing last time out. The 2015 19th-round draft pick did not allow a run in 5 2/3 innings and struck out seven. The 23-year old lefty spent all of 2016 with Greenville and posted 14 wins with a 4.78 ERA.